Back in the day, in the era commonly known as B.T. (before Trump) our political classes would choose candidates based on their ability to lose. For instance, when I was a democrat, the party nominated Walter Mondale to do battle with the wildly popular Ronald Regan. Regan had trounced Jimmy Carter four years earlier, so the wisdom seemed to be, let’s run Carter’s vice president Walter Mondale, that way every time the nation looks at him or hears his name the people will be reminded of Carter’s presidency, also known as the “Carter Apocalypse.” Yes, 18% mortgage rates, double digit inflation and the lowest labor participation rate since the great depression were all reasons to vote for Walter Mondale, if you were an idiot, that is. Mondale was massacred, of course. Past that, nothing much was was learned, except how to lose even more effectively, which my liberal brethren apparently reveled in as a major accomplishment. Four years later, George Bush senior ran for the highest office in the land. As Regan’s vice president, he seemed a good bet. In response, the democrats nominated Michael Dukakis, who, like Walter Mondale, had the personality of a dead accountant. As expected, he was beaten senseless. This kept me in a near perpetual state of awe at my party’s ability to do that which seemed completely irrational. Eventually, they wised up and nominated Bill Clinton, a man who was as savvy a politician as any, and a real fighter, to boot. Bill Clinton knew he couldn’t run as a liberal, because liberalism of the Carter/McGovern variety was completely out of step with most Americans. That meant that he had to run as a stealth republican who was a democrat in name only. Eventually, the stars aligned and Clinton and the democrats finally won the Whitehouse after 12 years in the wilderness. Without a short recession under Bush sr.’s watch, it probably wouldn’t have happened. Meaning, what is bad news for some, can spell victory for others. Initially, Clinton was hated by the leftwing of his party, but only until the republicans began to overstep the line so egregiously in their attacks that it backfired. Ultimately, public sentiment turned and gave Clinton and the Dems eight years as president. The worm turned once again with the republicans regaining the Whitehouse and George W. Bush serving two terms. The final days of George W’s presidency, however, more closely resembled the Americans fleeing on the last plane out of Vietnam, than the grand end of an era. That brings us to the present and Barack Obama. Like Clinton, a recession became his ally. Obama was also ably assisted by a fawning press, enabling him to surf the waves of a financial disaster into the presidency, becoming the first Black Man in history to hold office. Obama was the McGovern presidency that never happened and Jimmy Carter 2.0, only worse. At least Carter’s presidency came at a time when The Federal Reserve still had a limited mandate. The Fed also had a leader in Paul Volker with some big cajones and a willingness to jack interest rates through the roof in an effort to head off the inflation that was eating Americans alive. Imagine losing more than ten percent of your income every year while getting no raise to offset your losses. That’s what inflation was doing to average Americans. Volker responded by raising interest rates so high that it choked off the economy even further until prices began to drop and inflation was rendered powerless. Admittedly, Carter had a hand in this victory by appointing a bulldog like Volker, knowing full and well that it might kill his presidency. And, it did, not by its lonesome, there were other factors, as well, but it undoubtedly helped to do in the Carter presidency. For that, Carter deserves some credit. Which brings us back to Obama. Obama has no such Fed-head to take the wheel and steer America back on track. Instead, what we’ve had, beginning in the Clinton years, is a much more activist Federal Reserve, followed by a series of Fed-heads who simply would start up the printing presses at the first hint of an economic slowdown, leading to the government running amok with spending. Why not, money was as cheap as water and if you’re going to go crazy with deficit spending, that’s the time. Of course, that’s also how we’ve accumulated nearly twenty trillion dollars of debt, with no end in sight. This brings me back to Trump. Trump is a last ditch effort to take back the country from politicians too cowardly to do anything but pander to whoever will scream the loudest and longest. Trump is also a businessman with a capital B. A man who got multiple billion dollar projects done in New York that had been floundering for decades as taxpayer money was poured down a bottomless whole of cronyism and vice. 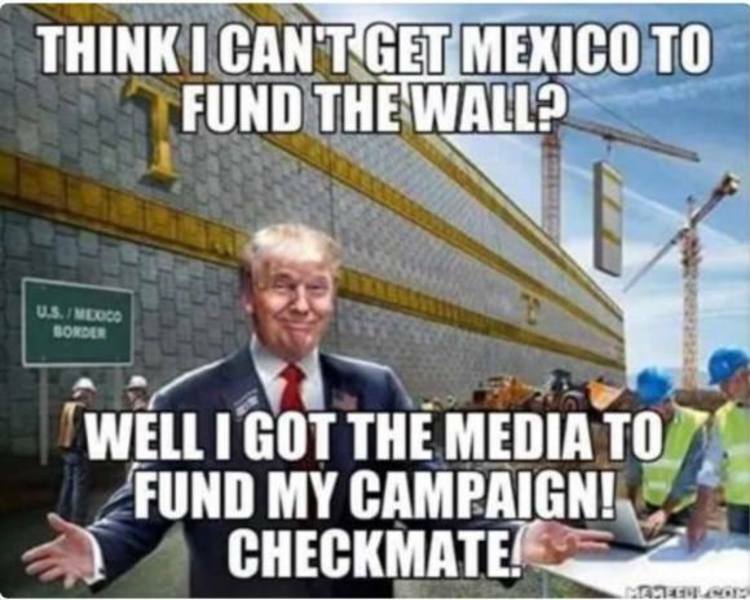 That is, until El Trumpo took charge and got these projects done in record time and under budget, a miracle of New York politics, if ever there was one. That alone, gives me hope. Moreover, Trump can fight as mean and dirty as they come. In politics, this is a handy skill. Meaning, when Bill and Hillary start to play rough, El Trumpo will hit back and take the play away in a fashion seldom seen in modern politics. He’s already done this numerous times to Bill and Hillary, demonstrating his peerless pit fighting skills. And last, but not least, the press can’t resist the man. The only thing they love more than their leftist ideology, is headlines, which are the lifeblood of the news business. And, if Trump knows anything, he knows how to generate headlines, making the media his unintentional lap-dogs. ​So, to summarize, The Donald is not Mike Dukakis or Walter Mondale, not even Mitt Romney. He is an uncaged beast, a roaring lion, a bringer of doom—to the democrats, that is. Add in a fundamental grasp that poorer Americans are being swamped by immigration, weak leadership and a political class that could care less about the well-being of average Americans because they're sold out to big money donors, and you have the hope that El Trumpo will be different. Which, he is. In the end, it may not be much, but it’s better than nothing.